Bees are a majorly important link in our food chains. Without bees, the entire ecosystem would quickly collapse. They also provide us with much valued products like honey, pollen and beeswax. 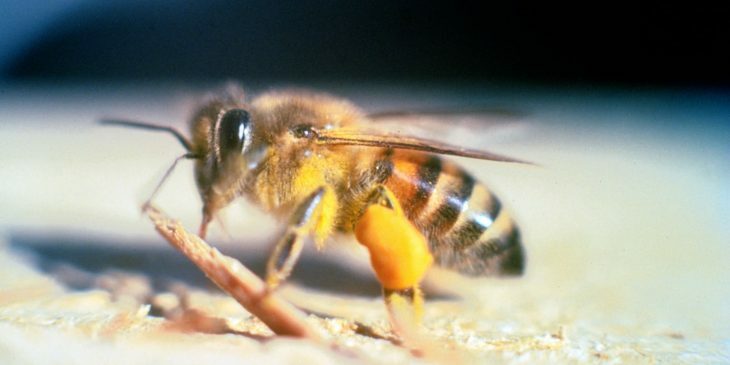 Bees can sting, but are very unlikely to do so, unless they’re seriously under threat. So don’t be afraid, and welcome all types of bees into your garden. Before we get into our list of 16 types of bees common in the US and Europe, let’s get some facts straight. 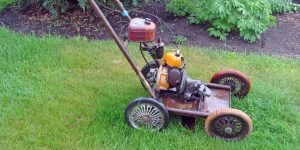 Lots of people have asked me over the years how to get rid of bees from the lawn or garden. While I can see how ground nesting bees can be menacing, especially if you have kids or pets, I don’t think it’s a good idea to poison the poor things. 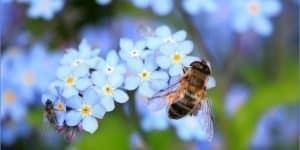 If your set on minimizing the amount of bees flying around your yard, firstly you can look into plants that repel insects. Planting some of these plants in strategic places of your yard will help minimize the amount of bees that will seek refuge in your yard. If planting insect repelling plants doesn’t do the trick for you, have a look at organic insect killer. This is an insecticide which is safe to use around pets and kids. The Africanized honey bee is the one feared most by the average person, even though only one or two people are killed by these bees each year. 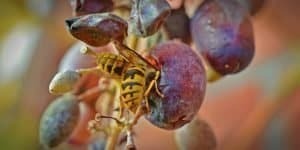 Many people call them killer bees, but in fact, their venom is no more powerful than other types of bees. 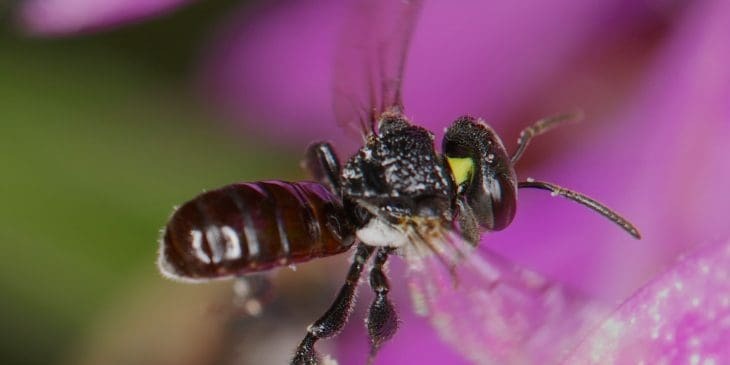 These bees are smaller and darker in color than the European honey bee, and since they usually sting in greater numbers than other types of bees do, many people think they are deadlier. Distinguishing between African and European honey bees is actually simple, especially if you look at their behavior patterns. The African honey bee is much more defensive, especially of its nest, while the European honey bee is a little more docile. Furthermore, although many bees will sting to defend their nest, the African honey bee often attacks the same intruder with hundreds of bees, which is why deaths from their stings are usually the result not of the venom itself, but of the number of stings received. These are European bees that are solitary in nature, so they do not produce honey or build colonies. 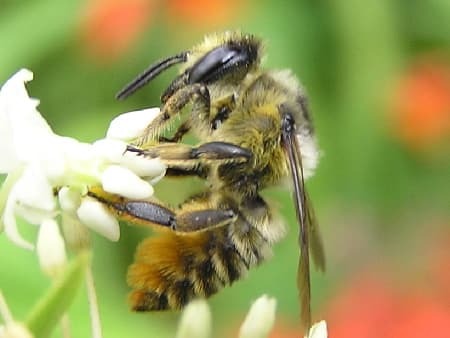 The Alfalfa leafcutter bee feeds on pollen and nectar and unless it is threatened, it usually poses no harm to humans or other animals. The females of this species will build their own nest, usually out of log tunnels or old trees. Farmers use this type of bee for pollination purposes, where it can pollinate foods such as fruits and vegetables. 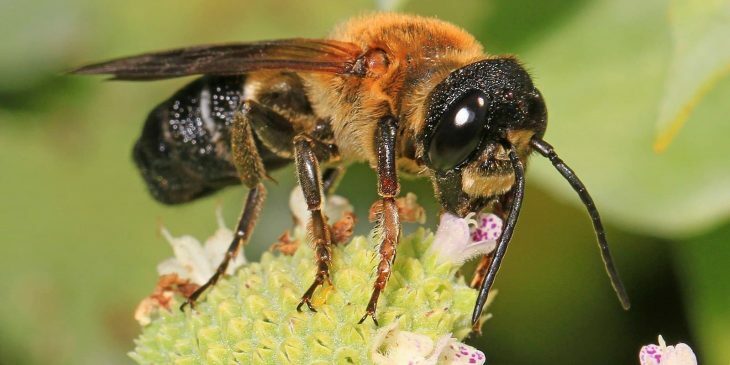 Found mostly in the eastern part of the United States, this bee is solitary and was the first known bee to make nests out of completely synthetic materials. Instead of constructing nests from cut leaves, the Bellflower resin bee uses plant resins and materials like them. Medium in size, the females tend to be larger than the male bees. Although considered nonaggressive, the bees have been known to sting, even though it is a mild sting, and they build their nests independently of one another. Also known as the Maine or southeastern blueberry bee, this insect consists of several different species and they pollinate blueberries, hence their name. They are fairly large in size, getting to over half-an-inch in length, and they look similar to carpenter bees or bumblebees. The males have faces with yellow markings, and when you face either the male or the female head on, you’ll notice the faces are heart-shaped. They mostly show themselves from March to June, and they have a bald abdomen. Bumblebees are excellent pollinators and have a soft buzz that remind everyone that summer is here. When you think about it, they are actually very charming animals, and they sting a lot less often than many people think. In fact, their stings are relatively rare. 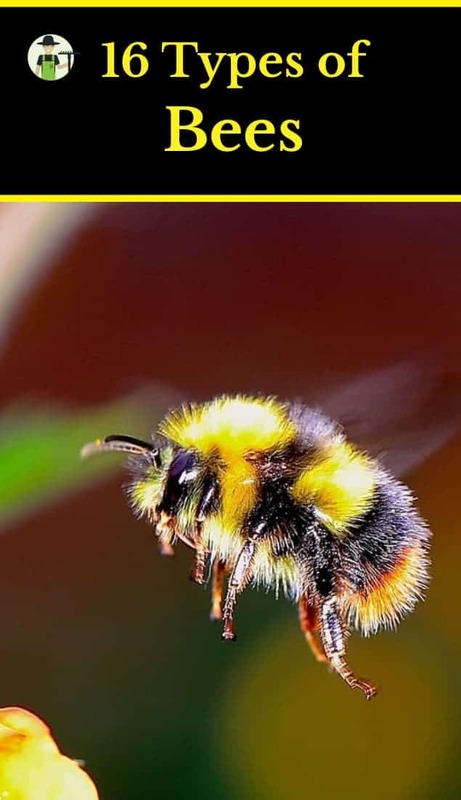 Bumblebees are very social creatures and will nest in a variety of places, including a crevice in the wall, a rodent hole that is abandoned, and even compost heaps and bird houses. 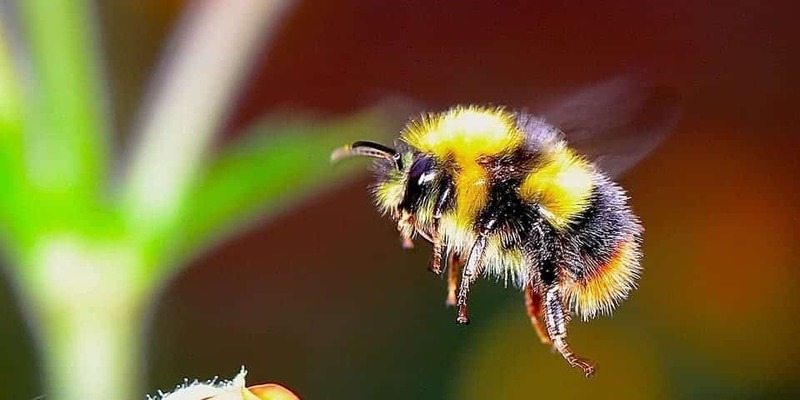 Because of the shape of their bodies, bumblebees are excellent pollinators, and they have different tongue lengths and therefore different pollinating habits. 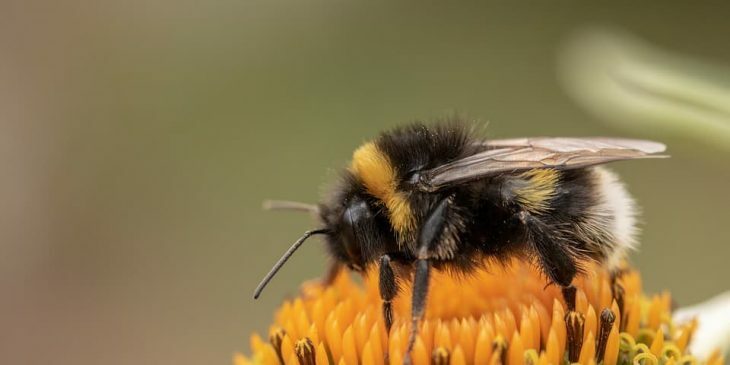 They are a furry insect that is better adapted to cooler climates, and this is when they are often seen, even though it is the same time of year that many other bees are in hibernation. 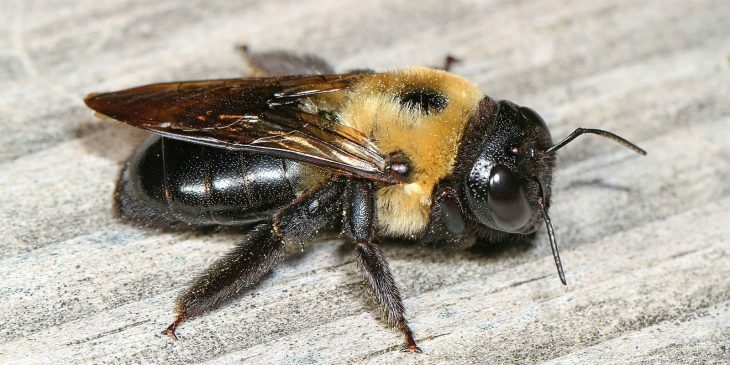 Found mostly in the eastern United States and Canada, the eastern carpenter bee eats nectar and pollen and has nests made of various types of wood. It does not have a queen, although areas such as foraging and reproduction are usually handled by strong, dominant females. Their bodies are mostly black and have a purple tint, and the males have a longer body, while the females have a wider head. 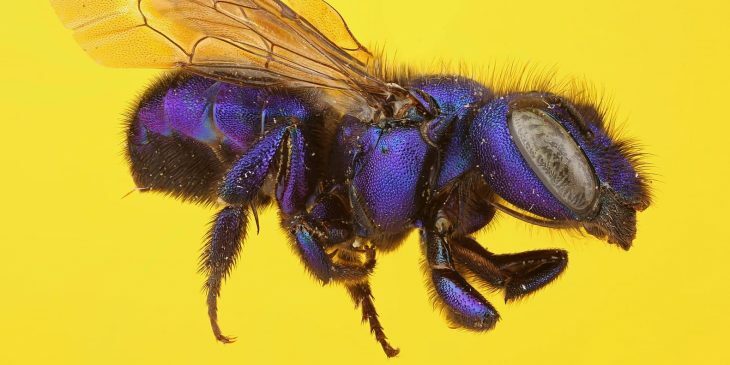 There are over 400 species of the eastern carpenter bee, and their nests usually include wood, agave stalks, and bamboo culms, as well as other similar materials. 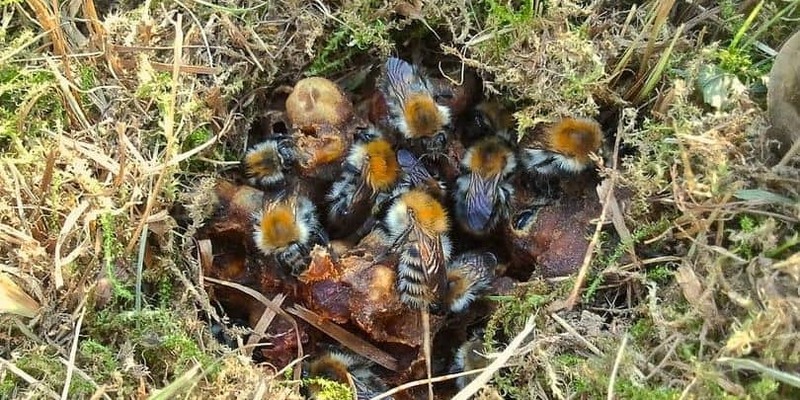 These types of bees can be social or non-social, and there are nests that accommodate each of these. 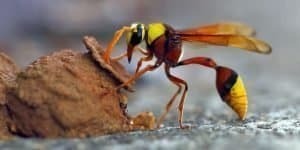 They do exhibit some destructive behavior, mostly when they weaken some types of wood in certain manmade structures, but are otherwise safe to be around. 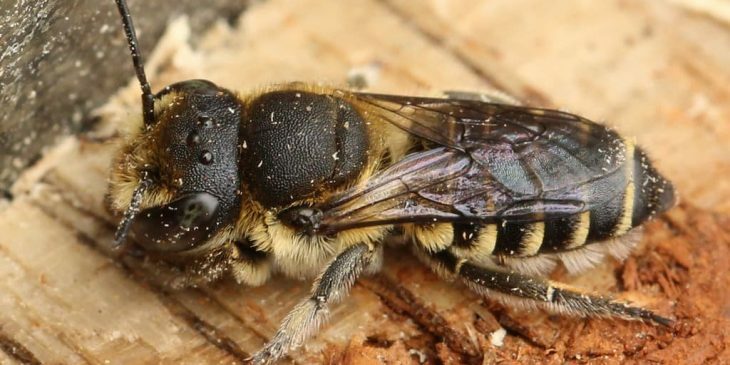 These are solitary bees that are found mostly in northern Asia, and they consist of extensions that look like small horns protruding from the lower part of their face. 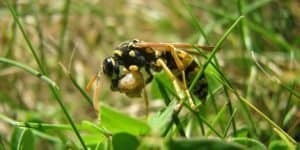 They are docile insects and have been known not to sting even when they’re aggravated. 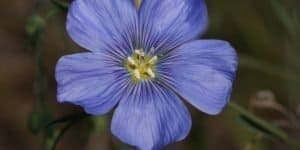 They were introduced in the 1940s in Japan for the sole purpose of pollination. In fact, these bees can pollinate flowers in a very fast period of time – usually only four to eight minutes per flower. This means they are capable of pollinating roughly 2,500 flowers every single day. 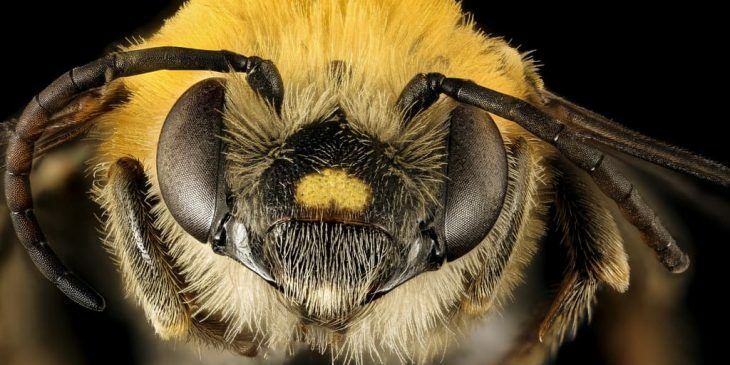 Another thing the horn-faced bee is known for is its ability to work in many different temperature ranges, which makes them even more valuable than honeybees when it comes to pollination of crops. 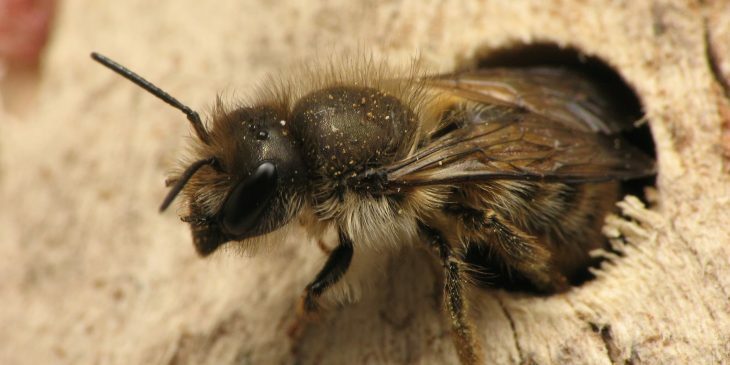 The mason bee got its name because it uses mud and other “masonry” products to construct its nest. 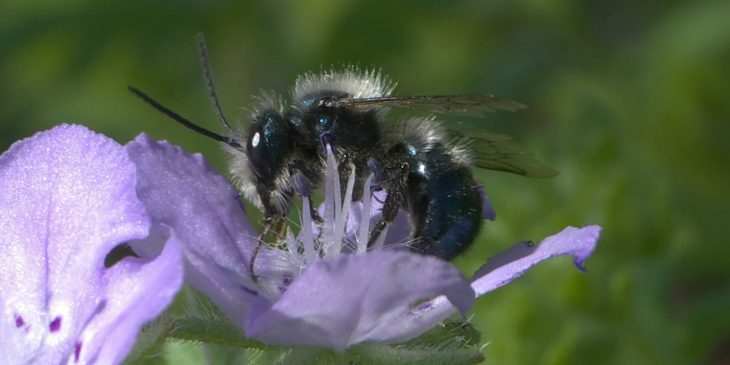 There are different types of mason bees, and they are usually metallic blue or green, as well as dark-red or blackish in color. Mason bees are solitary and do not produce either beeswax or honey. They rarely sting, even when improperly handled, and their personality is a very docile one. Of course, if they do sting you there’s nothing to be concerned about, because it is a light sting that is not very painful. Mostly seen from March to November, the southern carpenter bee is usually purple and black in color and very large in size. Their nests are created with materials such as woody plant materials and different types of dead wood. They are solitary bees that do not live in colonies, and their many species account for their differences in mating habits. They are found in the southeastern United States, as well as in Mexico and even in Guatemala. However, lately they have been found as far away as Arkansas, which some experts believe is because of the climate changes occurring right now. The males of this species are very territorial, which affects their mating habits. Some males have been known to be very aggressive, particularly when they fly into another territory. They are also nectarivores, and the males forage from 12 p.m. to 4 p.m. during the summer months. Also called a gourd bee, the squash bee is of moderate size, about the same size as the average bumblebee. Many of them can fly in near darkness or complete darkness, and they usually do not pollinate foods such as melons and cucumbers. They are best known for pollinating cucurbits – plants of the gourd family – and they have hairs on their legs that carry pollen and enable them to accommodate the pollen of the host plants, which tends to be very coarse and large. Sweat bees are mostly green in color, although some of them are red, and the males especially can have yellow markings on them. They can also be metallic in color. They are relatively small in size, and they usually nest on the ground, although some do nest in wood. 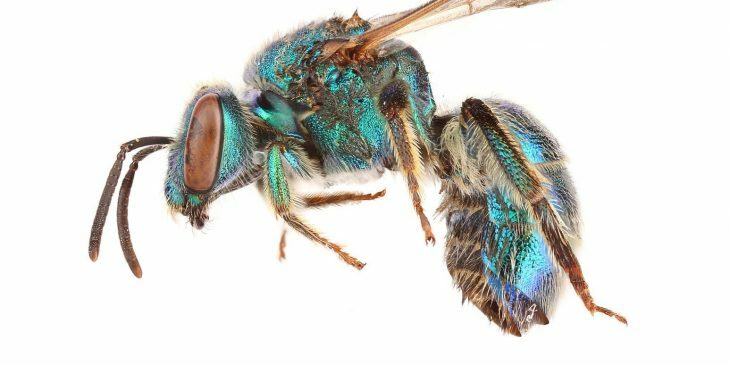 Most of the species of sweat bees are pollen feeders, and they may also be categorized as important pollinators. 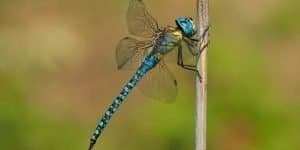 They get their names because they have short tongues and are, therefore, able to lap up human sweat quickly, although they are usually not very aggressive insects. Sweat bees pollinate various crops and wildflowers, including sunflowers, and they have complex digestive systems that enable them to accommodate many different pollen types. Usually growing to roughly one inch in length, the valley carpenter bee comes in a few different colors, with males usually being gold with green eyes and females metallic black in color. Because they have the ability to thermoregulate, valley carpenter bees can fly in various temperature extremes without becoming too hot or too cold. They are excellent pollinators that are found mostly from New Mexico to northern California, and this includes foothill and valley areas. 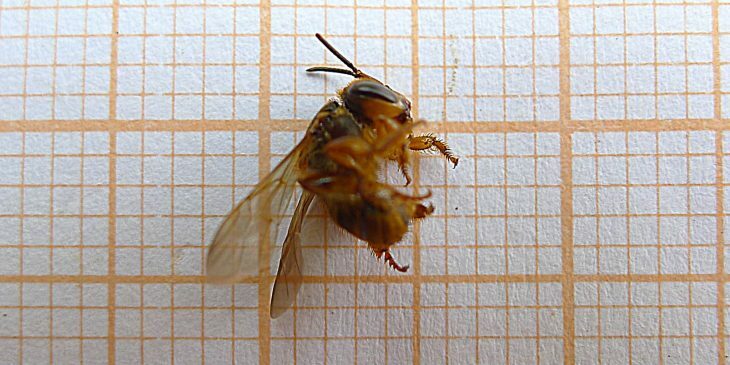 When compared to other bees in California, the valley carpenter bee is the largest at just about an inch in length. The male valley carpenter bees do not have stingers and in fact, both males and females are relatively harmless. In addition, the bees have long lifespans and are able to visit many different types of plants. Also called the European honey bee, these bees are eusocial and create colonies with a queen and worker bees. They use a dance language and pheromones to communicate with one another, and many beekeepers keep them for both their honey production and their great pollinating capabilities. One of the most interesting characteristics of the western honey bee is the fact that they are studied by scientists for their learning and memory skills, as well as their social evolution. 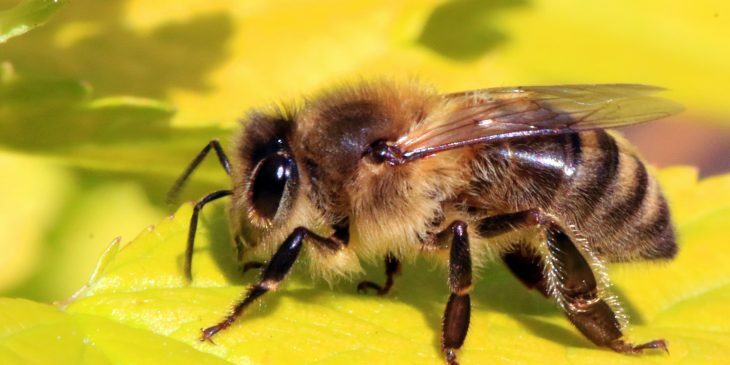 With the exception of Antarctica, the western honey bee is found all over the world, and they are one of the few invertebrate animals to be domesticated. The first proof of this domestication comes from tomb paintings from the year 1622, which depicted Europeans bringing the bee to North America in that year. 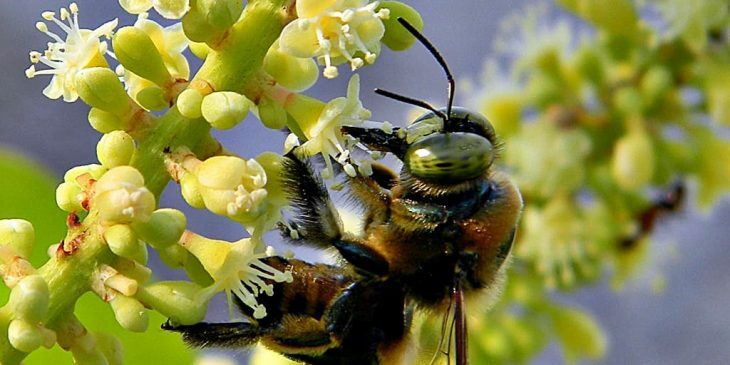 Native to western North America, but found in both Mexico and Canada, this bee is black in color, but has long yellow-white hair. Its wings are clear, but its veins are black, and the pollen basket located below the abdomen is a bright-red color. They usually drink both nectar and pollen, and they live for approximately one year. 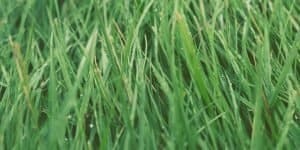 They love orchards and meadows, and they create their nests by digging small burrows in soil, sand, rotting plants, gravel, or wood. 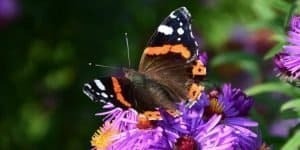 They are important pollinators that pollinate fruits, vegetables, and wildflowers, among other things. Found mostly in Brazil, the Mandaguari bee has a very important role – that of pollinating the many rainforests in the area. Their nests are usually created in hollow sections of certain tree trunks, and they also create a lot of honey. 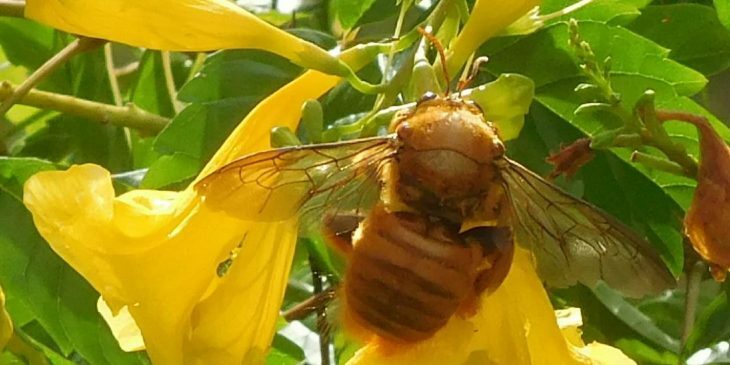 Indeed, this type of bee accounts for roughly 30% of all pollination in certain Brazilian ecosystems and up to 90% of all pollination for many species in the Amazon and the Brazilian Atlantic Forest. The bees especially love eucalyptus, and the secretions and saliva they use for securing their nests also have antiviral properties. 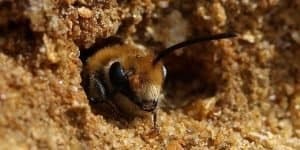 With a small body size and found mostly in the northeastern section of Australia, the sugarbag bee has a highly developed social structure, much like the honey bees. Their bodies are usually black and have microscopic hairs covering them. They tend to fly no more than absolutely necessary, which means close resources are preferred over those that are far away. They use a mixture of beeswax and resin from plants to construct their nests, and the nests are commonly found in woodlands and open forests. Their colonies are usually active all year long, but they do best when temperatures stay at around 65 degrees.